PERSONALIZATION: a: Select correct style name or color b: Click the yellow button on right “”Customize Now”” c: Write the text you like to be engraved, it could be Name,Initials, Coordinate, Date or even a phase of words, Message,Monogram,symbol etc d: Click “”Add to Cart”” If the Self-Customize Service can not satisfy your request,please “”Contact Seller””after your order. Personalized Jewelry: Unique Meaningful memorial gift for your friend,family,lover etc, or a good treat for yourself A beautiful velvet bag ready for gift giving Handcrafted with care, Custom engrave your jewelry gift to the special one Perfect gift for birthday, anniversary,engagement,christmas,surprise gift, graduation, valentine’s day, inspirational gift etc. 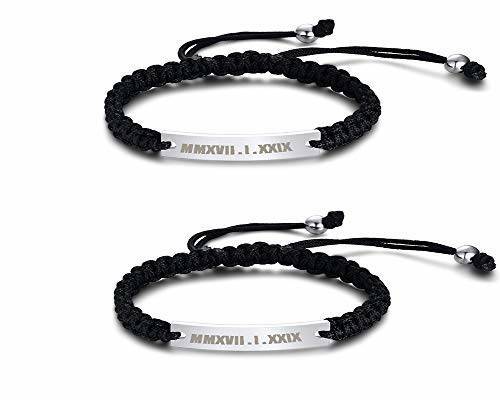 Custom Engraving ID Bracelets : offer free engraving, Personalize it with a message of your choice for a symbolic statement .eg:name, special date, promise,feelings or special Significant logo. Please click”Customize Now”before you add the cart. Our Products: We choose stainless steel instead of brass or alloy. Because it’s highly resisted to rust, corrosion and tarnishing. Durability and Fashionable. All makes it a top fashion accessory. OCCASION: The Perfect Gifts For Valentines Day, Birthday, Father’s Day,Christmas,Wedding,Engagement,Promise,business,Anniversary Day for Dad,Groomsman,Groom,husband,friend,family etc. Suitable for any occasion. PACKING&AFTER SALES: Comes with Mealguet Velvet bag,Great for Gift giving. 30-Days Money back guarantee,100% Secure shopping. Great product, delivered on time Beautiful bracelet. Well made and sturdy. Engraving is perfect. No defects. My boyfriend loves it. Arrived when promised. I would definitely order from this company again. Stylish and good quality This bracelet is stylish and well made. The lettering on both sides, which is real engraving, has made it possible for me to express a sweet tribute for a teenager who lost her mother to cancer a month ago. The bracelet arrived in a velvet bag, making this purchase an elegant gift.